“There are inevitably serious problems involved when it comes to using live animals in productions, and I don’t mean just aesthetically, with animals falling ill, defecating, urinating and so on. “Animals become stressed and anxious when they are forced into unfamiliar or frightening situations, and stage sets—with their bright lights, heavy equipment and noisy crowds—are obviously traumatic environments for them. “Then there is the transport to and from the venue, which also proves stressful as animals do not understand what is happening. She went on, “Should you opt to use real animals—and we hope you do not—please do as the producer of Babe did and ‘pay them their wages’ by making sure that they are retired to an animal sanctuary after the performance, rather than being sent back to farms and ultimately slaughtered." "The set was designed to contain real grass and real soil. The use of animals drew criticism from the animal rights organisation People for the Ethical Treatment of Animals (PETA). 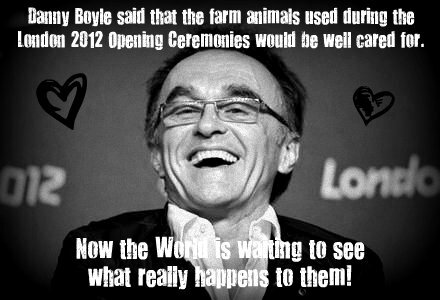 Boyle replied to PETA, assuring them that the animals would be well cared for." In a letter to the Captive Animals Protection Society, the Olympics committee's director of ceremonies Bill Morris said they will return to "future roles in movies and theatre". He said: "Because the animals come from a specialist supplier we understand that none of them are intended for the food chain. "Indeed it is expected that they will return to natural surroundings and any future roles in movies and theatre."